ZQ(R) series of slurry pumps are hydraulic devices composed of coaxial motors and pumps that are submerged in the fluid to work. These pumps are characterized by unique structure wide passage, high capacity of removing sewage, and high quality materials, offering excellent corrosion resistance. They are suitable for transferring the liquid containing solid particles, like sand, coal slag, and tailings, and removing slurries in metallurgical plants,mines, steel mills, or power plants, as an ideal alternative to traditional pumps for taking away slurries. These pumps are developed by the company by absorbing internationally advanced technologies, and using wear-resistant materials, which greatly improve the service life and reduce the maintenance workload. The pump includes a set of agitating impellers at the bottom, aside from the main impeller, which create turbulence for precipitated slurries, and thus enable transport of high-density fluids without the help of any auxiliary device. The pump also involves a unique sealing device, which can effectively balance the pressure inside and outside the oil chamber, thus keeping balance between the pressure at both ends of the mechanical sealing, ensuring the reliability of the mechanical sealing as much as possible, and consequently greatly extending its service life. On request,the pump comes with many protective measures, such as overheating protection and water detecting, allowing for normal operation over long periods in harsh working conditions. Meanwhile, other protective measures,such as anti-condensation creams for motors and bearing temperature measurement devices are available on request to enable normal operation in special situations. ZQR hot water submersible Slurry Pump can remove the fluid shall less than 100 ℃. According to customers requirements, which can add thermal overload protection and water detection device, which can be working safely in harsh environment for long time. 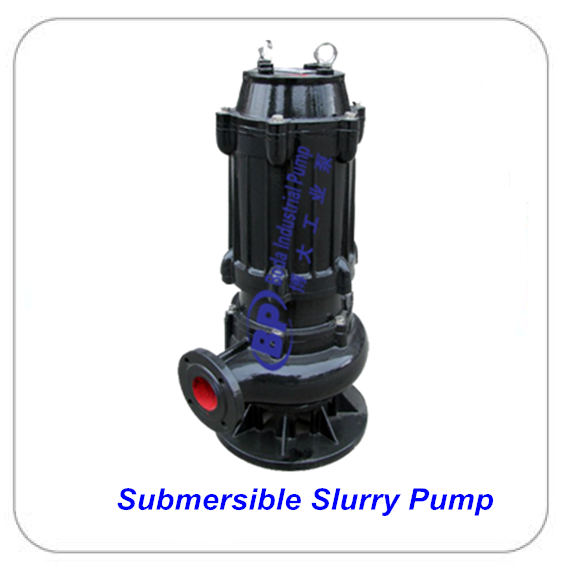 ZQ(R) series of Submersible Slurry Pumps have been very popular among customers since launching into domestic markets. 1. No limitation on delivery heads, high efficiency, and thoroughness in removing sewage. 2. No auxiliary vacuum pumps is required, bringing down the cost of ownership. 3. No auxiliary agitating device is required, thus enabling easier operation. 4. No complex ground protection or fixation device is needed for fastening the motor in water, thus allowing for easier installation and maintenance. 5. 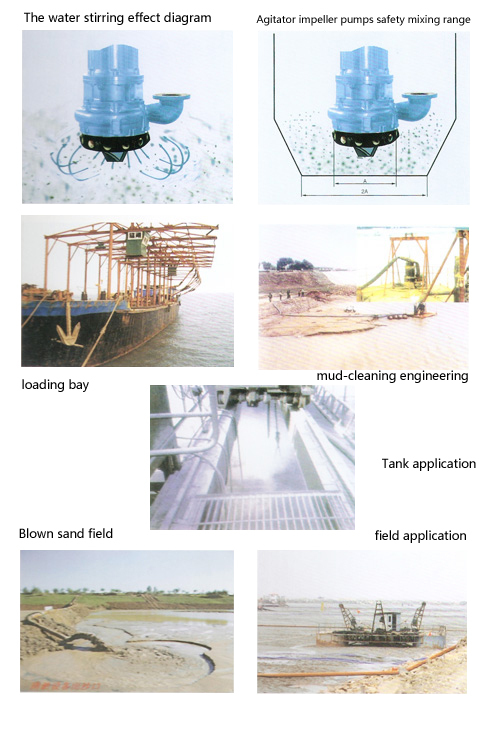 As the agitating impeller is in direct contact with the surface of sediments, the fluid density can be controlled by the submerged depth, thus enabling easier control of density. 6. The device is submerged in water to work, thus producing no noise or vibration, and making the work site cleaner. Provided with a three-phase AC power supply of 50HZ/60HZ, 380V/460V/660V. For ZQ models, the fluid shall not be high than 40 ℃ in temperature, for ZQR, the fluid shall not be high than 100 ℃ in temperature, containing no flammable and explosive gases. 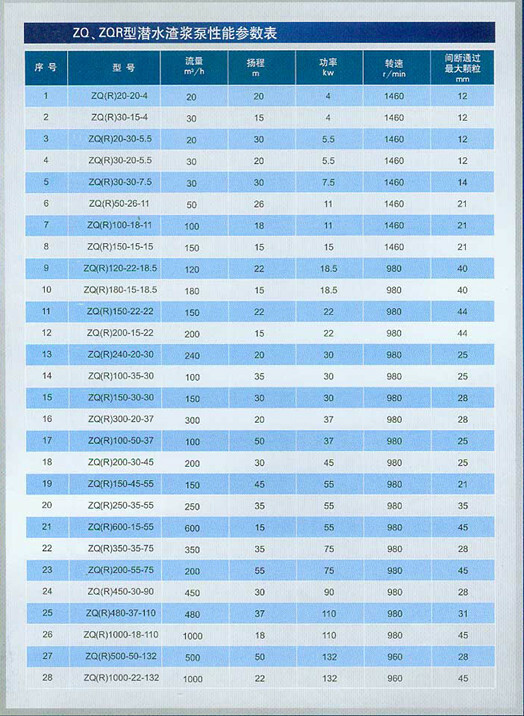 The content of solid particles in the fluid by weight shall not be higher than 30%, and the density of the fluid shall not be larger than 1.2kg/l. The maximum submerged depth shall not be more than 20 meters, and the minimum one shall not be less than the height of the motor. 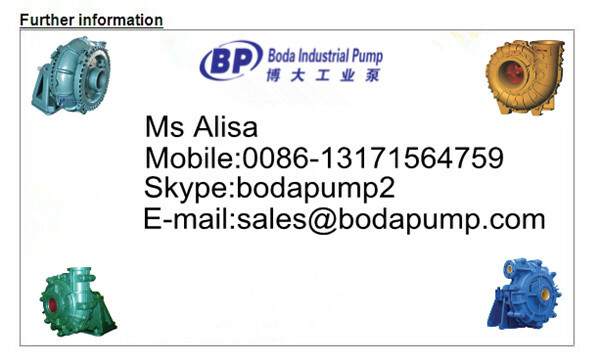 The pump shall run at normal conditions in the fluid, in the continuous operation mode. When the one-site conditions fail to meet the above requirements, please highlight them in the order. Customization is available. They are suitable for delivering abrasive wear slurry for metallurgy, mining, coal, power, petrochemical, building materials, municipal environmental protection and river dredging departments. 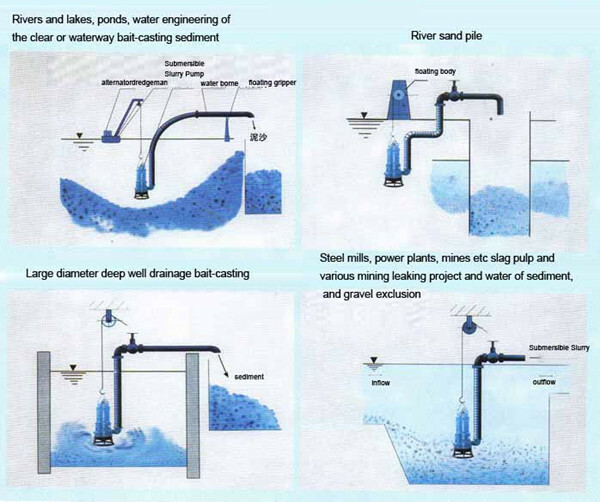 Looking for ideal Submersible Slurry Pump Manufacturer & supplier ? We have a wide selection at great prices to help you get creative. All the Wear Resistant Slurry Pump are quality guaranteed. 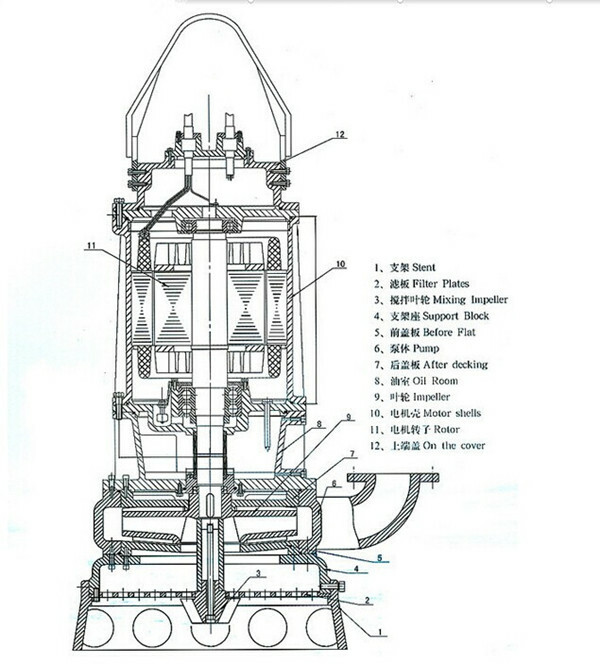 We are China Origin Factory of High Abrasion Submersible Pump. If you have any question, please feel free to contact us.